As one of the biggest proponents of the traditional “minimalist” Chicago hot dog (quit calling them “depression dogs”. They don’t depress me, they make me happy), I’d like to nominate Redhot Ranch for a GNR Award. Redhot Ranch’s hot dog is a shining example of the natural cased hot dog, steamed so that it still retains some snap and minimally topped like I like ‘em. Their fries are hand cut and double fried to a golden crispy deliciousness unmatched by many of this type of vanishing breed of hot dog stand. Though the dogs are small, they proudly stand among giants such as Gene & Judes, Jimmy’s & Poochies, who have already gotten their GNR Awards. 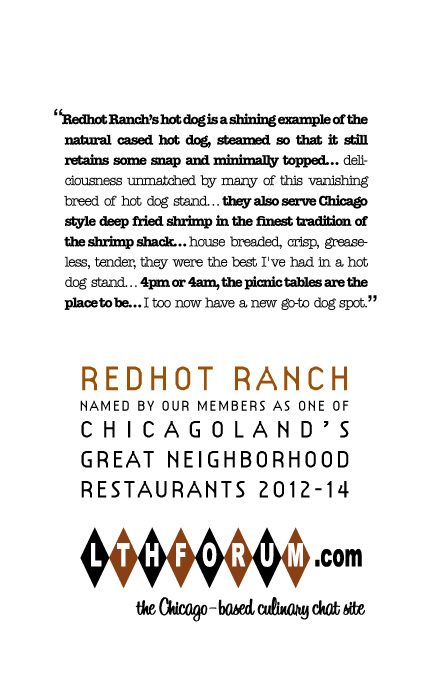 Redhot Ranch is deserving of a GNR Award on the strength of their hot dogs alone, but they also serve really great Chicago style deep fried shrimp in the finest tradition of the shrimp shack, itself another vanishing breed in Chicago. It’s the 1 – 2 punch of a dog and a ½ lb. of fried shrimp that makes Redhot Ranch a special destination for me. Add to that the fact that they are open late (5:00 AM on weekends) and you have a perfect recipe for a GNR. Redhot Ranch, which was first brought to our attention by the intrepid food explorer khudo shortly after it opened back in early 2010, has been discussed in detail on LTH Forum. It’s mentioned in nearly every thread about fried shrimp and/or late night places to grab a snack. The main thread is here. I hope you all agree that Redhot Ranch would be a good addition to the GNR pantheon. Great nomination, I heartily second it. I used to eat here on a weekly basis, and my only consolation for moving away from it is that I'm now a few blocks from it's original outpost by Comiskey! The breaded shrimp are my favorite in town, as is their minimalist dog. Those fries...I love everything about this place, I think it would be a terrific GNR. Just last night I was talking with turkob about the GNR noms, and he asked me if I was going to nominate anyone. I said that the only place I had in mind was RHR, but I felt kind of silly nominating a hotdog stand. That said, I love RHR and fully support the nomination. The dogs are always snappy, the fries deeply potato-y, and the help behind the counter friendly. 4pm or 4am, the picnic tables are the place to be. If someone came to town and wanted the Chicago hotdog experience, the unrolling a dog and fries on the picnic tables of Redhot Ranch is what I'd recommend. I think it should be a GNR. I have only been to Redhot Ranch once, and it came on a nice fall weekend last year when I was alone with three kids (ages 5, 3 and 9 months) due to my wife traveling to St. Louis so she could be there for the birth of a nephew. The folks there could not have been nicer, I thought the food was great (this is my preferred style of dog as well), the older boys loved their dogs and fries, the oldest absolutely devoured a 1/2 pound of shrimp, and the baby happily gummed fries while we sat out on the picnic tables and watched the traffic flow by on Western. A very fond memory for me of the four guys in our family just hanging out, and my oldest son has asked several times if we could go back. Looking forward to getting back there as time permits. From what I have experienced (albeit in one visit), this seems GNR-worthy to me. I didn't think to nominate RedHotRanch because I actually thought it was already a GNR, silly me. I really love this place and ever since my beloved Demon Dogs closed, I've had to travel to Jimmy's or Gene & Jude's to get my fix. Since RHR oopened I can satisfy my craving once a week. I know there are people that don't like this style of hot dog, but it's what I grew up with and my taste buds are firmly set this point. I remember a wonderful article the late Louis Szathmaty of The Bakery restaurant wrote about how he took all his visitors to Demon Dogs to show them what a true American Food was, RHR brings back that taste and feeling for me. GNR yes. I finally got around to trying Red Hot Ranch, and I can't believe it's taken me this long. I'm a huge Gene and Judes fan, and RHR was equally good. The dog was snappy and the fries were exactly as fries should be (and crispier than the average batch at G&J too). I thought the shrimp were good, but the dog and fries really stood out as best in class. We've gone pretty far out of our way to grab a dog and fries at G&J. Part of me is sad to say it, but given how much closer RHR is to where we normally hang out, we will be visiting G&J a lot less often now. Great dog, great fries- and it's in my hood. I drive by it nearly everyday and stop as needed. Yes on GNR. I love this place, and I love this nomination. Our family hits the Ranch at least every few weekends, and it is my personal favorite in this class. Last I made a rare weekday solo visit on the way back from ORD after a weeklong work trip and a rough return; sitting in the late spring sun enjoying that dog and fries was such a pleasurable "yes, you are back in Chicago" moment. Great choice for a GNR. Had a need for a late night dog and fries last week and popped in around midnight. The surprisingly-friendly-for-the-graveyard-shift crew quickly cranked out a perfect minimalist dog and extra crispy fries. They don't do much at RhR, but they do what they do very well. Feels like a GNR to me. Did a GNR-nom crawl yesterday - lightweight version in that it only included Yoshu, followed by Redhot Ranch, but it was a satisfying way to spend an evening. Wonderful fries and great dog. Not sure how it flew under my radar so long. One of the best dogs I have had. Good shrimp, if a very different version from most others. Breading is very lightly seasoned so that a certain sweetness comes through with the shrimp. My batch was also fried a bit less than most - good crisp crust, but not as hard and well done a shrimp inside (I assume this will vary). Hit sauce was nicely tangy, more vinegary than sugary, which I suspect comes from using their normal, sweet cocktail sauce and dosing it heavily with some version of Louisiana hot sauce. Quick, friendly service in a spartan shack. I will go back. Top-tier representation of Chicago minimalist dog, late night hours, parking lot, pocket change pricing and best shrimp I've had at a dog stand or, for that matter, most dedicated shrimp joints. Redhot Ranch is (mostly) an after-bar stop for me, though, I have also been there at least few times during the light of day. I really like their snappy dogs and their fries, which I always request crispy (otherwise, they tend to get soggy wrapped up with the dogs). I'm not as big a fan of their shrimp as others here are. It's a bit of a shame that in a town with so many hot dog stands, a place doing them right can stand out as great. Given the sheer number of hot dog stands we have in town, the great places should be the coin of our realm. Instead, for whatever reason, they seem to be rare finds. This is exactly why I support Redhot Ranch as a GNR. It stands out amongst the (sizeable) crowd. Still, I wish that finding an excellent hot dog and fries in Chicago weren't such a remarkable event. However, until that day comes, Redhot Ranch should be recognized for its transcendence in the category.